Editor&apos;s Note: It&apos;s with a heavy heart that we at Visit Hendricks County want to republish a story written back in January of 2013 as a tribute to our friend, the late Doris Martin. We were saddened by the news late Wednesday that Doris died. She will be fondly remembered for her zest for life, her passion for education and her contributions to Hendricks County tourism through her work at the One Room Schoolhouse as "Miss Phoebe." That passion of reenacting history for the thousands of "scholars" as she liked to call them culminated in her receiving the Lt. Governor&apos;s Hoosier Hospitality award in 2011. Doris always was gracious whenever called upon to showcase the schoolhouse and Pittsboro community, whether it was for a tour group or media inquiry like the one recorded just last week on Fox 59 for Your Town Friday. Our prayers go out to her family and all of those who were fortunate enough to be touched by her. God bless you Doris. You will be missed! When I visit a new city or town, I always ask a local’s opinion for his/her favorite places. As a result, I developed this regular feature called Local & Lovin’ It hoping visitors to Hendricks County might benefit from the advice of long-time locals. This time I asked Doris Martin, a former teacher, who serves on the Curriculum Research and Development Committee for programs at the Pittsboro One Room School, if she would tell us about the history of that attraction. Fun Trivia: The Pittsboro One Room School is a Second Saturday site on the HCCVB’s Rural Routes to Main Street Cultural Trail. The One Room School offers both school-age and adult group programs. If you’re a fan of history (and a regular watcher of the History Channel or of fictionalized shows like “Little House on the Prairie”), this interview is especially for you. Q: How did you first get involved with Pittsboro’s One Room School? A: I took early retirement from teaching after 32 years in 1996. Our One Room School was moved 4 ½ miles to its present location, in February 1998. At that time, I was asked to serve on the Curriculum Research and Development Committee for programs at the One Room School. 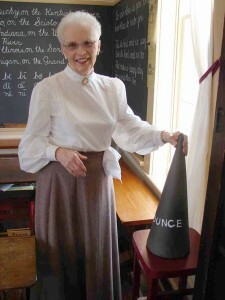 Q: For trivia buffs—are there a few little known facts you can share about the One Room School? A: With the help of our Hendricks County Community Foundation, through the Lilly Funds, our building was moved and renovated by the spring of 2000. Since that time, we have hosted over 22,000 scholars, both young and older. Our student classes experience a four-hour school day in the year of 1892. Our program meets the State Social Studies Standards for grades 3 and 4, and we also have many hom- schooled groups. Our school groups are local, as well as the farthest group coming from 60 miles. Adult programs are one to two hours in length. Our adult groups come in from Illinois, as far away as Akron, Ohio; Owensboro, Kentucky, and Sullivan, Indiana. We also have local adult groups of Red Hat Ladies, Sunday School classes, and family reunions, etc. 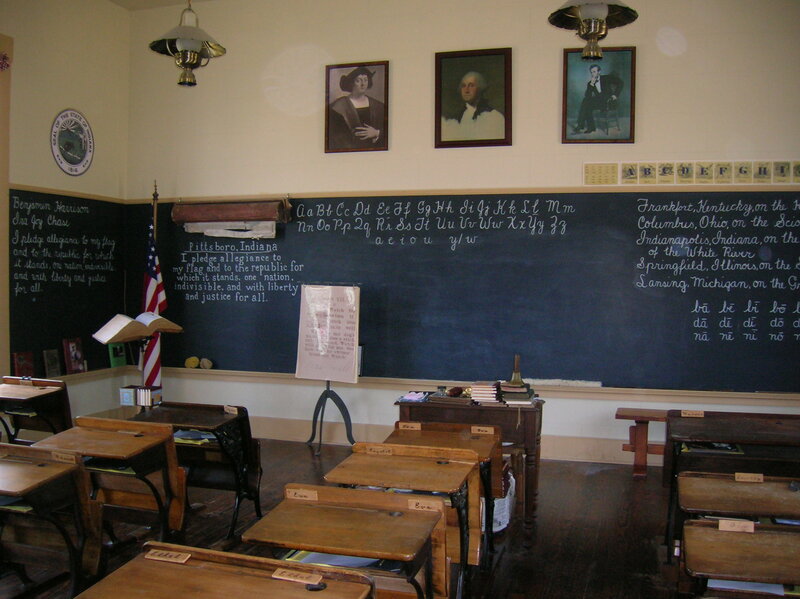 Q: How do students respond when they visit the One Room School? Our young scholars and teachers love this field trip. We have had young scholars look at us at the end of the day, and say, “Thank you for letting us live history today!” Students also love taking on the personas of former scholars who attended the Pittsboro One Room School in 1911. We have tracked these former students, and at the end of the day they enjoy learning what they grew up to be. Adult groups enjoy this field trip because many of them attended One Room Schools. Q: How can a school or group arrange a visit to Pittsboro One Room School? School and adult groups may schedule a visit to the One Room by emailing bentleym@tds.net, or calling Doris Martin at (317) 892-4107. For more information and history of the One Room School, click here. A bit off topic, but when you’re visiting Pittsboro… Q: Do you have a favorite restaurant/destination in Pittsboro? Pittsboro is a small town, but the Pittsboro Pizzeria, 91 N. Maple St., is an excellent place to eat! Their foods are delicious; they have a good variety; and even have gluten-free selections for those who need them. Do you have some suggestions for your favorite spots in Hendricks County? Do share! Leave a note in the comments, maybe we’ll be writing about your favorite place next.